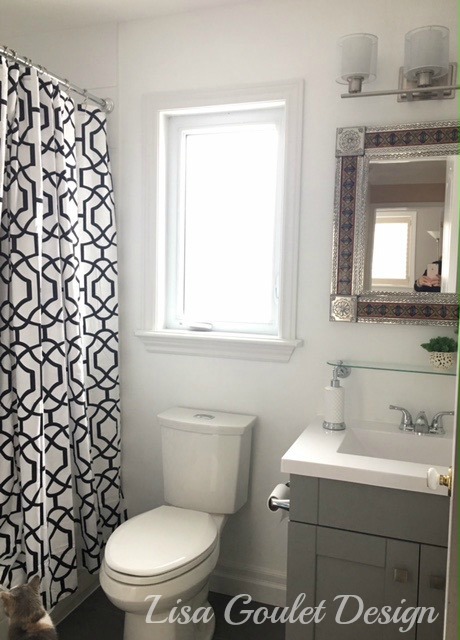 I’m sharing a before and after of a small guest bath that was completed recently. As you can see, it is now bright and fresh and ready for some Christmas guests. A few befores. removing the bulkhead made such a huge difference. 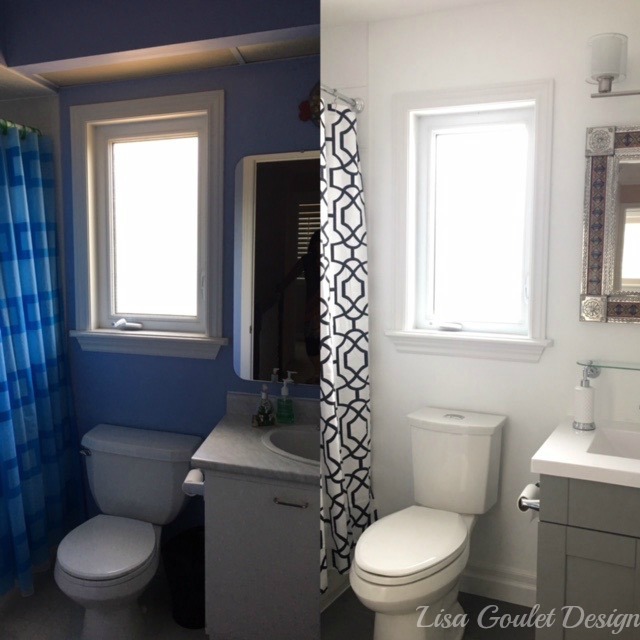 This was a budget makeover as it is a little used bathroom and my clients just wanted to bring it up to date and make it fresh and clean. 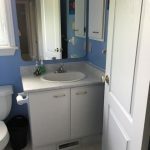 We shopped big box stores and used budget friendly pieces wherever we could. 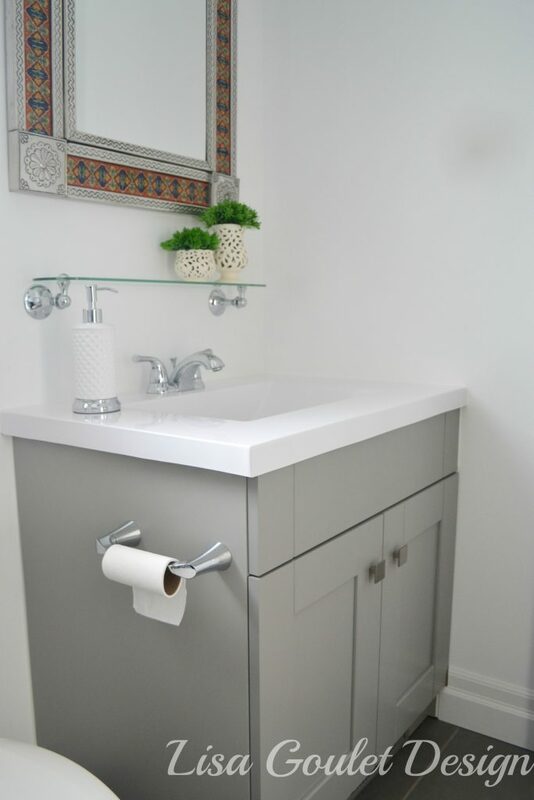 We did a solid rectangular grey tile on the floor and a simple grey vanity from a big box store. 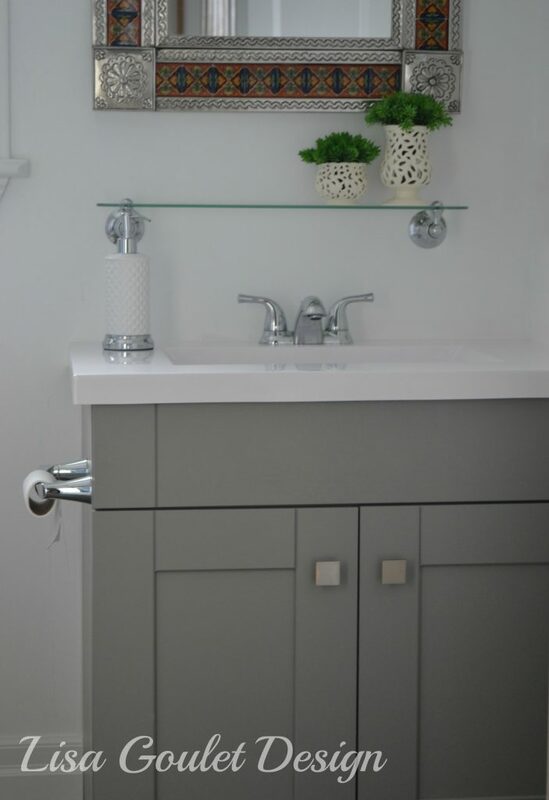 The client had purchased the mirror a few years prior and was itching to use it in the space. 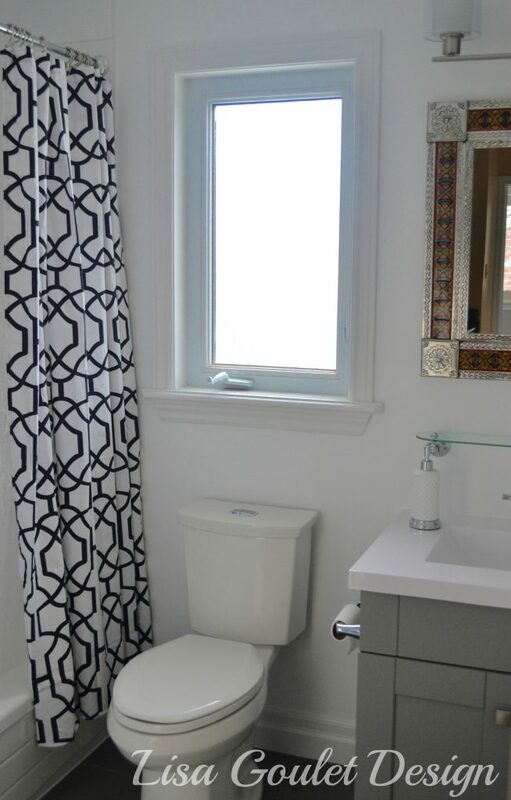 It adds a nice dose of personality to the room. 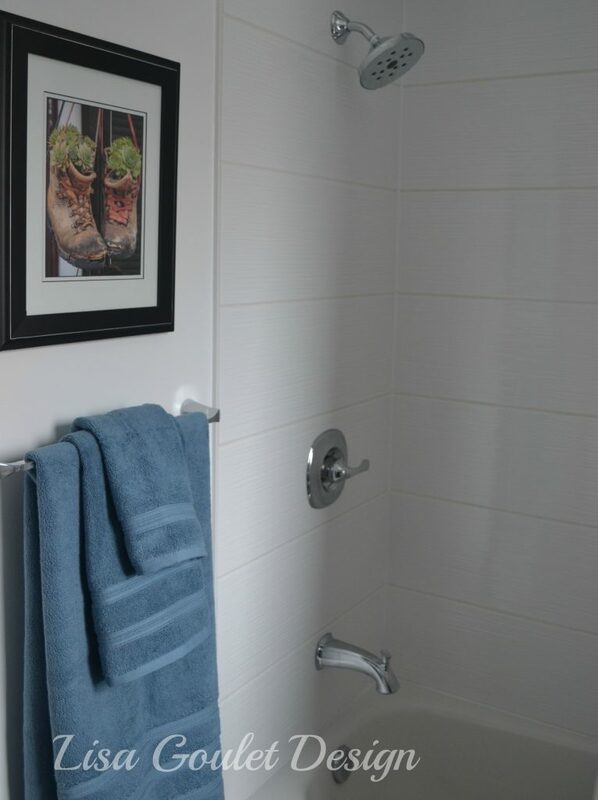 The large scale white horizontal tile with strie detail are absolutely stunning in real life. It’s a little hard to see the detail in a picture but trust me they are spectacular! 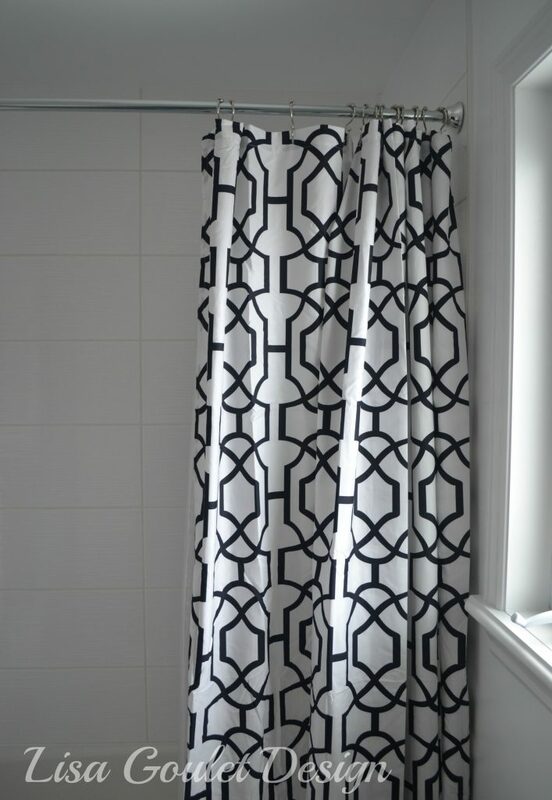 And the graphic black and white shower curtain, just adds the right amount of pop. 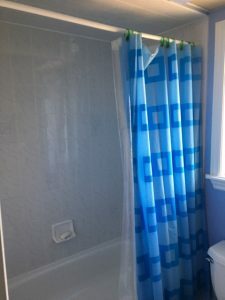 You can see them a little better in the above photo and we laid them in a grid pattern so that it the horizontal lines were unbroken, also 2 tiles fit the length of the tub and 1 worked for the depth…perfectly. Little to no cutting involved! When does that ever happen??? 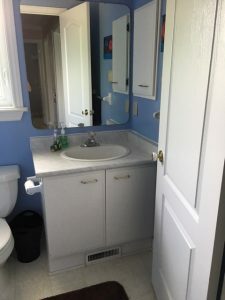 Here’s a good look at the vanity and the mirror. 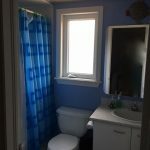 I pulled the blue out of the mirror for the towels but you could use any of the accent colours in the mirror to change it up. 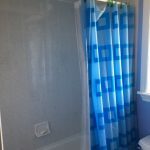 We painted the walls in white that matched the shower tiles, to make it feel bigger, as there’s no demarcation line between the tiles and the walls. 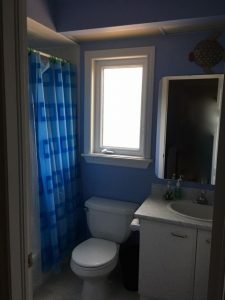 My clients also picked up a new low-flow toilet that is a higher more comfortable height. 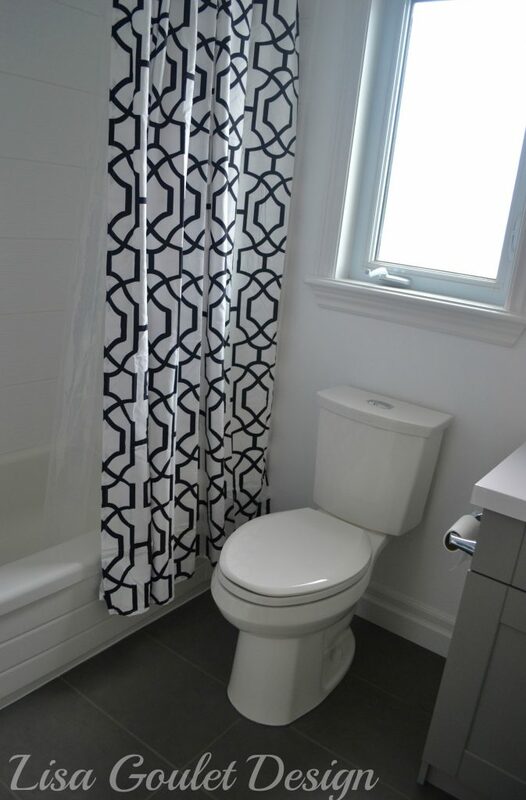 A better look at the floor tile that were done in a grid pattern. And if you look really close in the far left corner, you’ll see that even Phoebe approves.